Film Director & Writer : Michel BLUSTEIN. Original texts by Alexis JENNI, Prix Goncourt 2011. 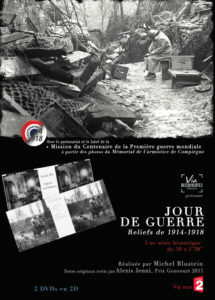 “DAY of WAR” proposed in 50 times 1’30’’ The three-dimensional exploration of a selection of stereoscopic plates (photos on glass plates) produced during the First World War. Based upon the original literary work asked of contemporary writer Alexis JENNI – Prix Goncourt 2011, the spectator shall embark upon a journey into the world of the 1914-1918 war, thanks to the words, sounds and the cameras movement. Through the sheer force of the evocation and production of these unique programs, the spectator shall be privy to the day to day lives, as well as battles, of “the theatre of operations” where these men and women engaged in conflict and risked their lives; whether they were soldiers or civilians, French or foreign. 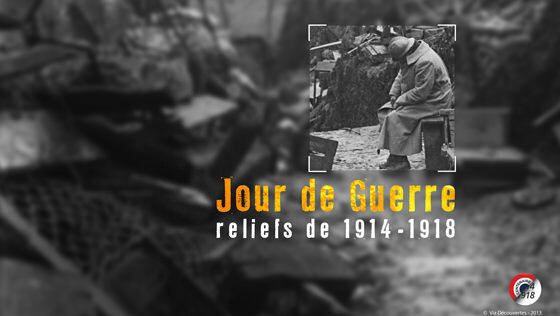 DAY of WAR is a combination of rigorous historical documentary work and the subjectivity of modern authors’ unique approach to an exceptional piece of world heritage material. – Commandez l’ouvrage unique !! !